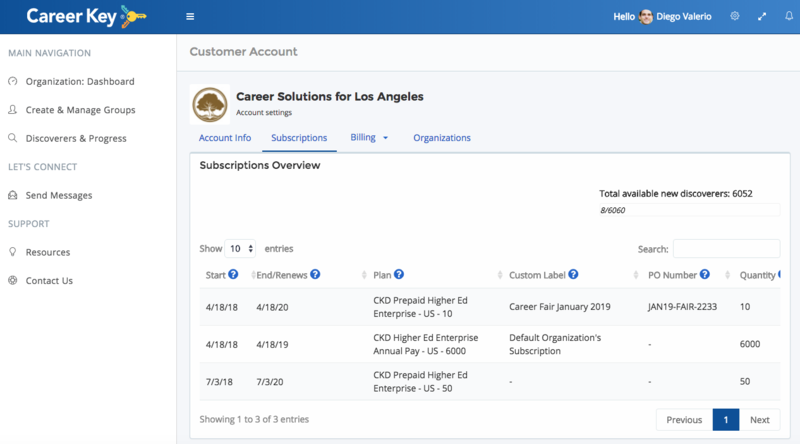 Use your customer account administration for financial, customer-wide tasks like managing your account information, subscriptions, billing, and sponsored organizations. If you are a customer user, you will see “Account Administration” as an option from the Gear icon. If you do not see this option, you are a organization user only (see My Organization). Then, use the column labels at the top to navigate between sections, starting with Account Info. 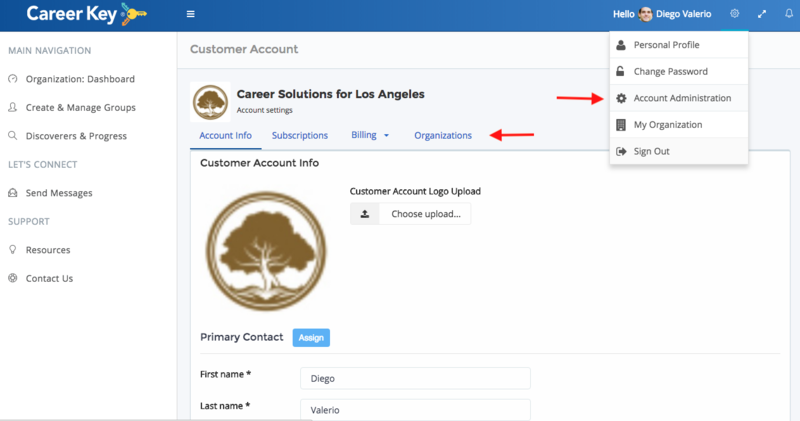 Update this section with your organization logo to personalize Career Key Central for your team. 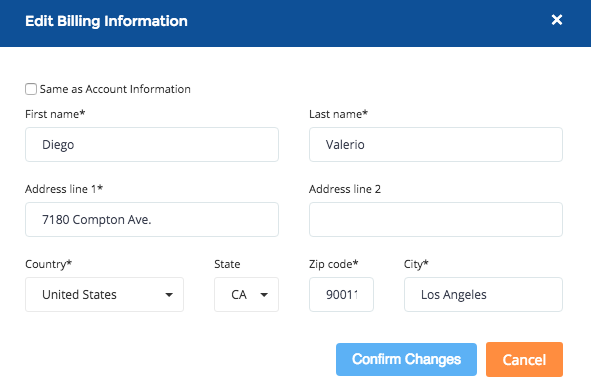 You can also update and assign your primary contact at any time. The primary contact is the same as the Account Manager, who receives all subscription and billing email notifications. 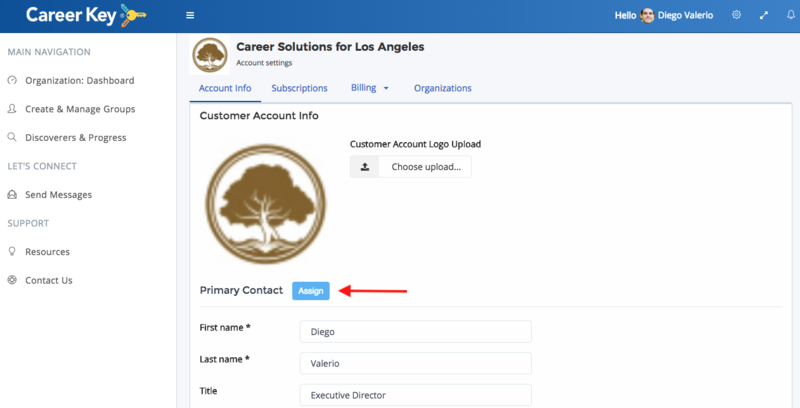 If you need to switch primary contacts, just click the Assign button and choose from one of the existing users in your primary sponsored organization. If it’s someone new to your organization, invite them first (and have them accept!) before assigning them as the new primary contact. Your country and language can be edited in a future release. These selections do not impact the language in which your discoverers take the CKD assessment. That’s determined by the subscription you’ve purchased and the technical configuration for your CKD plug in. At a glance, see how many new discoverers can register and take the assessment, based on the remaining quantity in your active subscriptions. Click on and scroll across the table to see all the details. 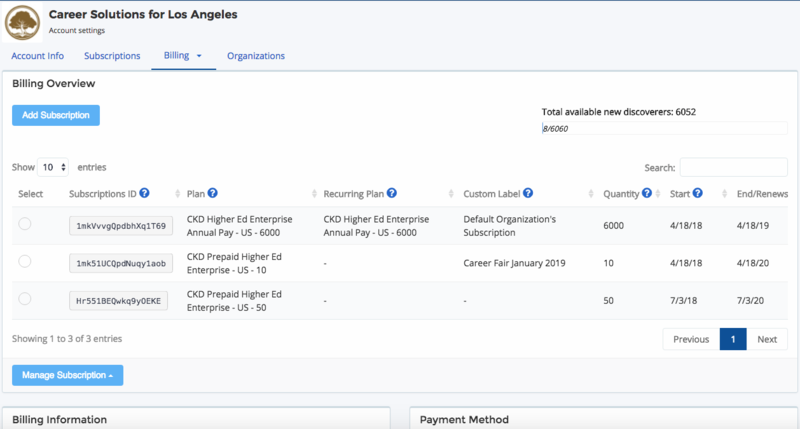 Use the Action button to edit a subscription’s custom label or a purchase order number for internal reference and usage tracking. 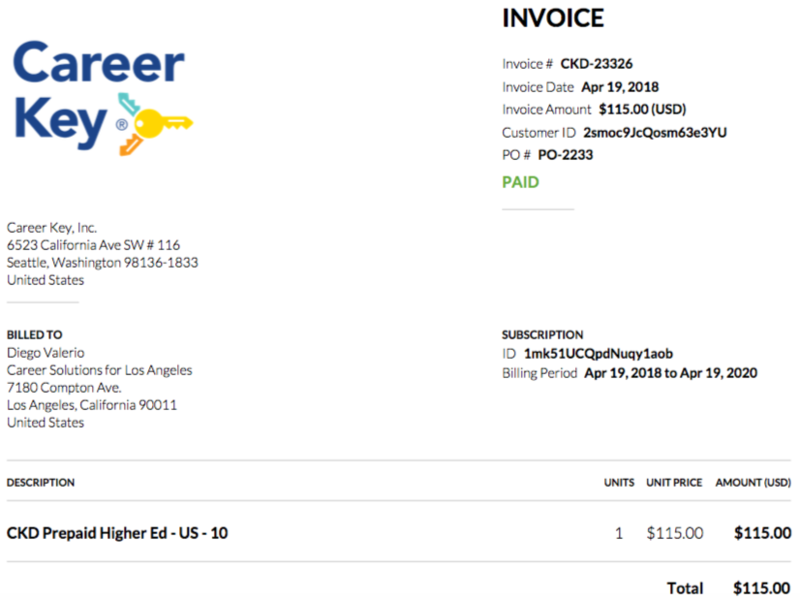 For example, this customer below is using a nonprofit grant to pay for a career fair they’re putting on, so they bought and labeled a subscription just for that purpose. 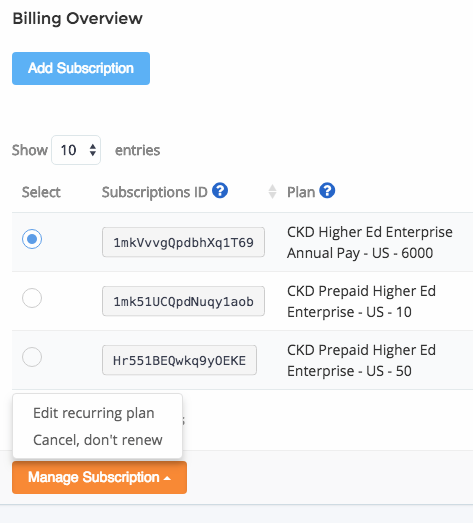 Adding, editing, or cancelling a subscription is handled in Billing, covered next. You can purchase a new subscription at any time. First, scroll down in Billing Overview to make sure your billing information and payment method is up to date. 1. Selecting a subscription to manage. 2. Click on “Manage Subscription” to show your options. 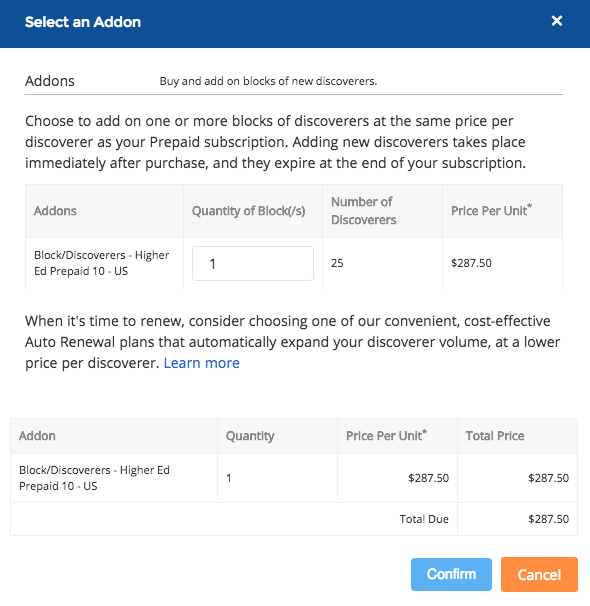 For prepaid subscriptions, you can add on one or more blocks of 25 discoverers before the end of your 2-year subscription term. You pay the per-user price based on your original subscription quantity. Whatever quantity you decide to add on, any unused discoverers expire at the end of your subscription term. You cannot cancel a prepaid subscription. For auto renewal subscriptions, you can edit the recurring plan before it renews. You might want to do this to take advantage of a lower price if you are using more or less volume than the plan you originally purchased. You can cancel an auto renewal subscription BUT, no refunds are issued and there are few advantages to doing so until your renewal date. We recommend you contact us first at support@careerkey.org to discuss the best option for you. Edit this information at any time. 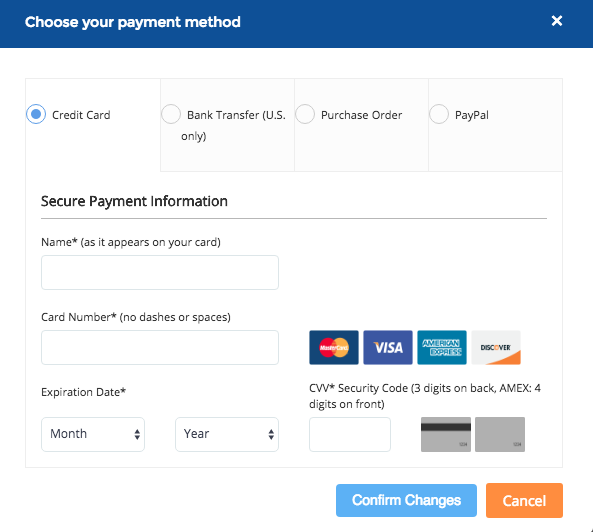 Edit your payment method at any time. Please note that our monthly auto renewal plans require a credit card, Pay Pal or ACH U.S. bank transfer payment method. View your history of invoices and payments. You can filter by payment type and download invoices and receipts. Signing in as an organization to see their activity. Your “default” sponsored organization is the one automatically created when you purchase CKD. 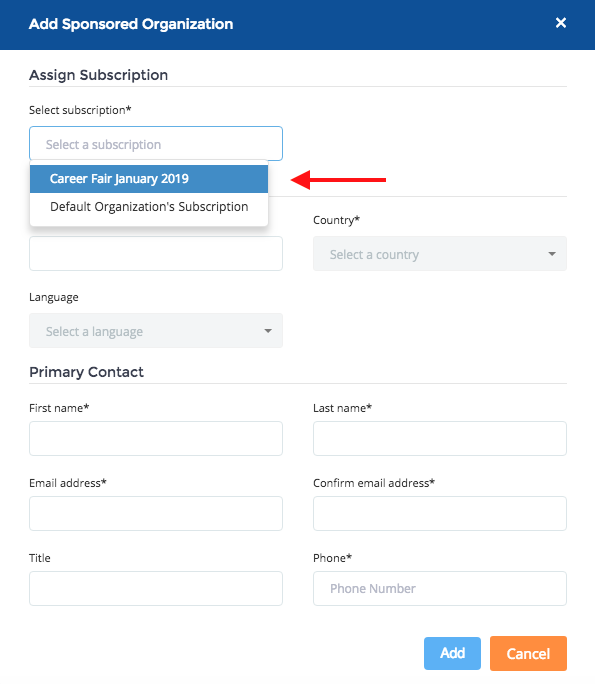 To access your default organization, select “My Organization” from the Gear Menu at the top right of Career Key Central. 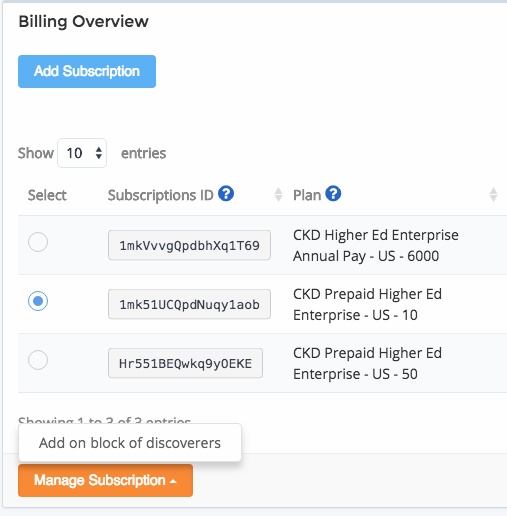 When you add an organization, you assign them to one of your active subscriptions. All plug ins for that organization use that subscription.